To request a seat, please email nigel_memorial@hattenjack.com. Places are quite limited and will be allocated on a first-come, first-served basis. If you are unable to attend the meeting, but would like to share a memory of Nigel, please comment below, or send an email to the above address. An hour-long programme of talks celebrating the life and work of the science writer Nigel Calder will take place on 2 December, which would have been Nigel’s 83rd birthday. Speakers are to be confirmed but will include his co-writer and friend Professor Henrik Svensmark. Details of how to request a seat will be given here (https://calderup.wordpress.com) on 11 November. Nigel Calder: Prolific journalist and author who did much to educate the public in the understanding of science, The Independent, 27 June 2014. Nigel Calder, 1931-2014, The Global Warming Policy Foundation, 27 June 2014. Nigel Calder, Bishop Hill, 28 June 2014. Scientist with a social conscience, letter from John Pilgrim toThe Independent, 3 July 2014. A friend has passed away, Nir Shaviv at ScienceBits, 1 August 2014. CALDER, NIGEL DAVID RITCHIE, science writer, died peacefully at home on 25 June 2014, aged 82, after a wonderful life. Most beloved and devoted husband to his true love, Lizzie, for 60 years. Adored and brilliant dad to Sarah, Penny, Simon, Jonathan and Kate. Steadfast and loving father-in-law to Nick, Charlotte, Jacqui and Giuseppe. 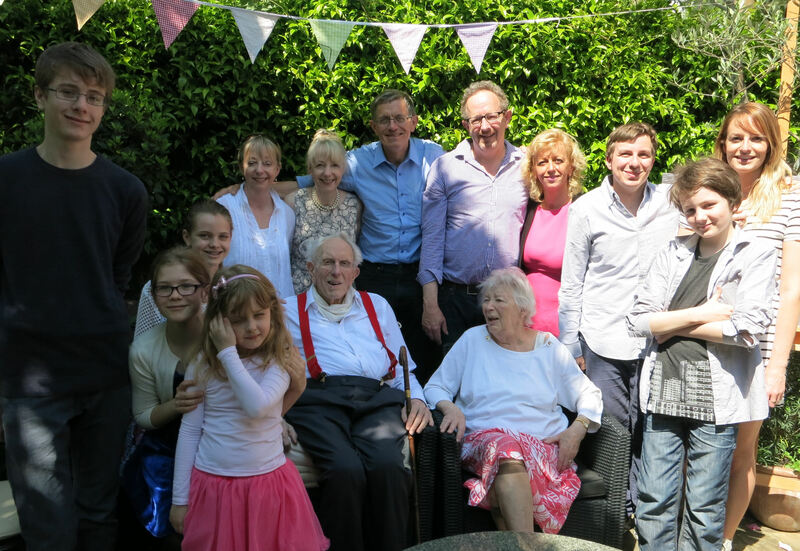 Proud and amused grandfather of Hannah, Nicholas, Robbie, Daisy, Poppy, David and Izzy. Funeral Friday 4 July 2014 at 2pm at St Paul’s Methodist Church, Crawley RH10 8ER, all welcome, followed by a private cremation. Wearing of black not necessary. No flowers please; donations if desired to The Dystonia Society or RNLI, c/o The Martins Funeral Directors, Crawley RH11 9BA, 01293 552345 to whom all enquiries should be made. Memorial gathering to be held later this year. With minor variations, the above announcement will appear in The Times and The Telegraph, on Monday 30 June 2014. That was the title of a famous essay by Bertrand Russell. Being myself a lifelong victim of the protestant work ethic, I was impressed at the Royal Society last night when the prize for science books 2011, now sponsored by Winton Capital Management, went to Gavin Pretor-Pinney for The Wavewatcher’s Companion (Bloomsbury). Although the book has a beach chair with sea waves on its cover (an icon of idleness) it covers waves of every kind you’d think of, and some you wouldn’t. Given the chance to read a passage from his book during the ceremonies, Pretor-Pinney chose the intricate waves of hungry amoebae. They assemble to make a slug-like object and then build a tower from which they send spores to look for happier hunting grounds. Salutary point (1) This is only the second book that Pretor-Pinney has written. The previous one was The Cloudspotter’s Guide, which of course I have because of my interest in the Svensmark cloud-seeding connection. Perhaps my only claim to fruitful idleness is that a literary by-product of my family cruising under sail, The English Channel, won the Best Book of the Sea award at the London Boat Show. Small world note: Gavin Pretor-Pinney also took part in the BBC-TV programme “The Secret Life of Waves”, which was made by David Malone, son of Adrian Malone who produced one of my BBC blockbusters “The Life Game” (1973). That programme took its title, and an important sequence, from a table game with nucleic acids played by biophysicists in Goettingen led by Manfred Eigen. Now Eigen has written the most interesting upcoming book that I know about just now. Due out soon from Oxford UP, it’s called From Strange Simplicity to Complex Familiarity. Oxford asked me for an endorsement and here’s what I’ve offered them. What a splendid antidote to the swagger of physicists and biologists who think they already understand the living universe! Manfred Eigen pulls back the carpet like a careful housekeeper and brings to light mind-wrenching questions that most scientists brush out of sight. His search for the physical roots of the logic of life is not an easy path to follow, but Eigen helps us all he can with his polymathic skill and lucid style. I fear it may be too mind-wrenching for the general readers targeted by the Royal Society Winton Prize for Science Books.